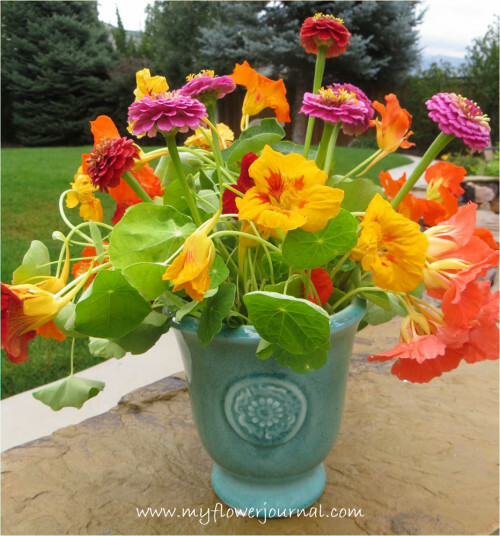 Nasturtiums are one of my favorite garden flowers so I put together a list of my top 5 reasons for including them in your garden and a few tips for growing them. You can grow them easily from seed. The seedlings are easy to identify. Other seedlings look like weeds to me and I accidentally pull them out. Nasturtiums have little light green round leaves when they sprout and look different. Nasturtiums like to be left alone and not transplanted and moved around. That’s one reason you don’t see as many starts in nurseries. They will re-seed in the fall if you give the plant a good shake letting the seeds fall to the ground when you pull it out. Poor soil means more flowers. Fertilizers encourage leaf growth. This is a real plus for my Utah garden. Our soil isn’t the greatest. They are edible so they are a good plant to have in your garden if you have young children that like to put bright colorful things in their mouths. They make a nice filler in pots and bouquets. After I plant my containers with bedding plants from the nursery I put nasturtium seeds in some of the empty spaces. After they grow their light green round leaves add a nice shape and contrast to the other plants and help the container look full. The trailing variety are a good “spiller”. Nasturtiums always used to be my sister’s favourite flower when we were little and allowed to help with the gardening! They grew like wildfire! I love your painting too, it’s great to be able to go and paint lovely summery things putside now the sun is out here in England! Thanks for visiting my blog. I have never planted Nasturtiums before but they may go on my list of things to try. Just beautiful. Pretty page full of lovely flowers. Your composition is perfect. Your watercolor flower journal is coming along. This page is also beautiful. What a nice book you will have when you finish. Thanks, Tammy, for the boost. I bought a bunch of seeds and tried them one year, but they didn’t grow. I figured they must just not like Utah weather/soil… I will have to try again. WOW, Tammy, you are surrounded by such wonderful inspiration! Your journal page is SO beautifully done! I haven’t planted nasturtiums in a few years so will have to give them another try. Loved your awesome journal page. Nasturtiums were one of my moms favorite flower. This post reminded me of her and her love of gardening. Your water color is so pretty. Thanks for visiting me. It’s a pleasure to meet you. 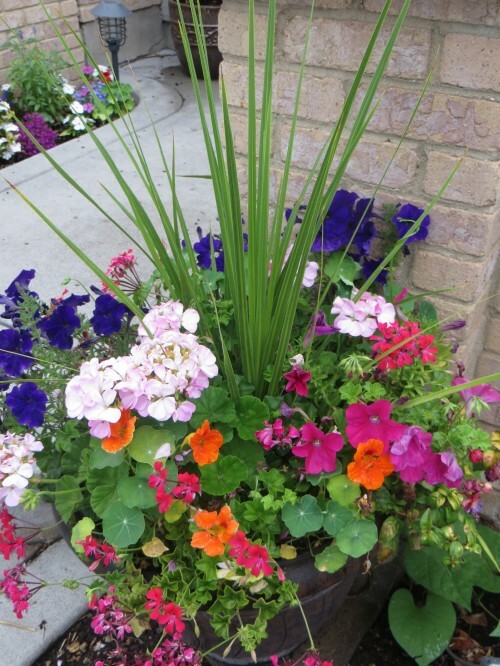 I LOVE FLOWERS and love planting from seed and love nasturtiums! I plant new seeds each year and have many returnees that find the spot to thrive. I am a color nut so they fit in perfectly. Fun to see your pots!!! Wow..such dazzling art..inspirational florals…beautifully done!Love your bouquet..and the vase is an exquisite color..beautiful post..I love nasturtiums too..and some little critter in my yard loves to eat them on me! Wonderful post! Visiting from SOC! your flower displays are so beautiful and your watercolor art is so full of gorgeous details and colors!! I love nasturtiums too – and you have taken some gorgeous pictures of them, they look fab with the hot pinks like that. Did you know you can pickle the seeds like capers? I love your bouquet this week! I usually plant nasturtiums in my vegetable garden, but I’ve never thought about putting some seeds in my containers to fill in the gaps. That’s brilliant! I’ll have to try it next year. Gorgeous flowers for the final SOC challenge. I adore nasturtiums! But somehow I have forgotten about them for a few years…yes, next spring I will plant seeds. I’ve been consumed this year with my new Scabiosas, both black and white, and in getting them to grow from seed (not an easy task!). I love your five reasons, and agree wholeheartedly! This is so pretty, wonderful interpretation! 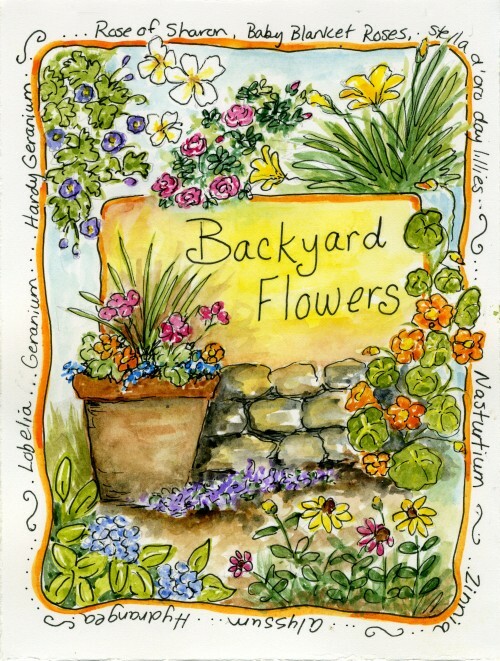 Wonderful garden journal!!. Love your blooms too :). Hands down my favorite bouquet of the week. The turquoise vase just MAKES IT. And of course you know that I’m a nasturtium nut. Just lovely! I love your work of art and all of the photos of your beautiful flowers, too!!! I love nasturtiums, because they’re so easy to grow and pretty too!